Dubai: A private school in Dubai will reduce the school week from five to “3.5 days” to allow senior students more time away from class to pursue their interests, it was announced on Monday. The Indian High School (IHS), rated ‘Very Good’ in government inspections, will implement the change for grades 11 and 12 from April, when the new academic year begins for Indian curriculum schools, said Dr Ashok Kumar, CEO of the school. The two most senior grades have around 1,300 students enrolled at the IHS which has a total of around 6,000 pupils. The change at IHS has been approved by the Knowledge and Human Development Authority (KHDA) under ‘Rahhal’, a programme for the ‘Dubai 10X’ initiative of Dubai Future Foundation. The second phase of Rahhal, which means traveller, was launched on Monday at IHS, which had also been the first school to take part in the first phase by allowing three students extended time away from class to become sports champions and learn advanced sciences. At IHS, grade 11 and 12 students will next school year attend class from Sunday to Wednesday, which will be a half day, while there will be no class on Thursday for them, said Dr Kumar. School timings for those grades will be increased by around two hours, lasting from 7.30am to 3.30pm, Sunday to Tuesday, to fulfil the requirement of 30 hours of learning per week under the CBSE education board of India, which IHS is affiliated to, he added. It is possible IHS will in the future implement a shorter school week for other grades, Dr Kumar said, depending on “the success” of the first roll out. He added that there is “a plethora” of options for students to make “productive” use of the “1.5 days” — learning a new language, practicing sports, doing an internship, learning through home tutoring, or even attending a special class at school — any school — to study a subject more closely. “But we have to approve it. All attendance on 1.5 days will be sent to us by the institution [where the student is going]. It can also be home tutoring. Without the trust of parents how can it be successful? They are our partners in this,” Dr Kumar said. All “due diligence” has been taken by IHS, including addressing all parents and sending them a circular, “to make this successful”, he added. The slogan for the initiative at IHS is “3.5+1.5 = 6”. When asked why it was 6 when it should be 5, Dr Kumar said the initiative was, in effect, freeing up Friday for the students. “The sixth day was always a Friday when children were busy doing these [extra-curricular] things outside school; they were not getting the full potential of the off day. Friday will now be completely free for them, so we have given them one ‘extra’ day,” he said. During an interaction with the press after the ceremony, KHDA director-general Dr Abdullah Al Karam was asked if other schools could also apply for a shorter school week under Rahhal, which is a much broader programme to “disrupt” education through innovative ways. Dr Al Karam replied “if a school checks all these boxes”, as IHS did, then “they can come and talk to us”. “For example, what is the curriculum, is the education board OK with it, is the school taking the measures ... Like with [IHS], do we know there is a ‘menu’ available [for options on 1.5 days] and there is a tracking mechanism, and the school is a very good school,” he added. Dr Al Karam also pointed out the shorter week model will only work “if schools want to do it, and if there is a commitment from the parents; if the school is ready to put in the manpower because it requires additional resources; do the parents want it for the right reasons — then the system works”. He added: “This will be the biggest cohort of students from a single school to enrol in the Rahhal programme and we commend the Indian High School for taking Rahhal mainstream with their pioneering approach to senior school. This flexible, customised approach to schooling will help students prepare for the future, and develop essential skills such as time management, prioritising learning needs, and independence. Every month, Rahhal open days are facilitated at KHDA to discuss ideas and facilitate information sharing with parents and students. I feel like I need some time in my day so I can devote it just for my well-being. And for me that hobby is painting. I can’t really do painting along with my science subjects in school because I can’t really incorporate that in science. The CBSE doesn’t do it that way. Art has been a huge part of my life and this time I’m going to give it the time and dedication it deserves from me. I’m really into debates. Last year I got the 20th rank in debates worldwide out of 1,500 students and the school helped me so much because I had to miss two weeks of school for prep and travel, because it was a week-long event. So when I came back I thought it was hard for me to catch up with my portion. So when April starts, I know that I can push myself to do more events in debate. I can find time and motivation for doing things that I’m successful in and I know that I can pursue. I can do internships because I know I’ll need that to do political science in university. I’m planning to go abroad for my master’s one day, so definitely learning a language has always been an interest since I was kid. I speak five languages — English, Marathi, Hindi, Telugu and a bit of Arabic. So the first thing I’ll be doing is of course learning a new language; I might learn Mandarin and Spanish. There will be special classes assigned in the school itself, but they will be tutored by people from outside institutions. There are many people in my classroom who want to join the same programme. Rahhal, which means ‘traveller’ in Arabic, is a KHDA initiative under the 10X programme of Dubai Future Foundation to ‘disrupt’ key sectors, including education, through innovative means. Objective: It encourages schools to customise learning experiences for individual learners, and extend learning beyond the classroom. Four schools took part in the first phase mainly focused on individual cases. The second phase was launched at Indian High School yesterday, which will shorten its school week from five days to 3.5 days for grade 11 and 12 students. It seeks to scale up the initiative from individual to group or school-wide programmes. 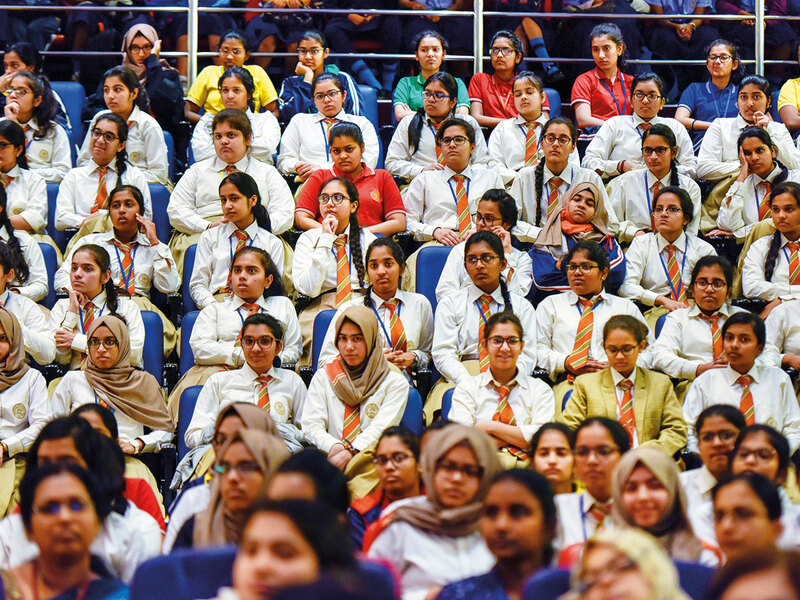 Indian High School was the first private school in Dubai to pilot a programme under Rahhal with three students who were granted extended leave to pursue their sports and advanced learning ambitions, and also provided special support with academics on returning to class.